Assistant Provincial Grand Master David Winder couldn’t have hoped for better weather for the ‘Raven Winder’ walk in aid of the MCF 2021 Festival. This was the 2018 keynote fund raising event for the Festival and the fine weather encouraged over 100 walkers to don their boots. Looking at that great ball of fire shining on high, some would have been forgiven for predicting the consumption of large quantities of cooling drinks. Fortunately, just before the off a light cloud covering appeared, this allowed the participants to get through most of the journey out in relative comfort. 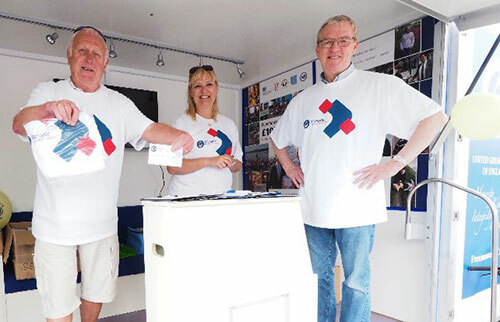 Pictured from left to right, are: Jeff Lucas, Adele Shields and Phil Preston handing out T shirts. Leading the array of families out of Egypt (well, Heysham Village car park actually) was Provincial Grand Master Tony Harrison, supported by his wife Maureen, David Winder and his wife Sue, along with newly appointed Assistant Provincial Grand Master David Randerson and his wife Anne. Leading the way for the Royal Arch were Assistant to the Provincial Grand Principals Chris Butterfield and his wife Marie, along with Provincial Grand Scribe Nehemiah Dave Barr and his wife Helen. Having donned their special T-shirts, issued by Provincial Grand Charity Steward Phil Preston and his team of Adele Shields and Jeff Lucas, everyone set off at a brisk stride. It soon became obvious that Nigel Norris, the master of Poulton le Sands Lodge No 1051 was intent on arriving at Happy Mount Park in Morecambe first. He was accompanied by his lodge charity steward Malcolm Lowe and their dog Mac. There was a third member of this group who will not be named because (and I only have hearsay evidence of this) he was tempted by a pub on the way back. However, there is no doubt that Nigel, Malcolm and Mac were the first there and the first back, completing the whole round trip in two hours and 20 minutes exactly. A remarkable achievement considering this included photos at the halfway point and a run along the beach for Mac. Left: Maureen Harrison (left) and Tony Harrison (fourth from left) with the South Fylde cyclists. 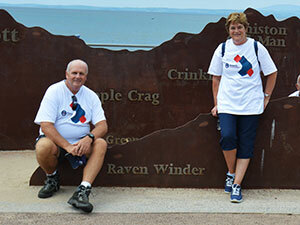 Centre: David and Sue Winder (left) with fellow walkers. Right: A photo with Eric is compulsory! The more casual participants took a more leisurely stroll but still kept up a steady pace. Passing the historical Midland Hotel and adjacent ‘Stone Jetty’. That is, until they were stopped by Stuart Aimson for the obligatory photograph at the standing diagram of the Lakeland fells. This just happened to indicate where ‘Raven Winder’ stands, near Flookburgh, on the north shore of Morecambe Bay. It was at this stopping point that the ‘Winder’ double entendre became clear. Other stopping places before and after included the whimsical statue of comedy legend Eric Morcambe, a challenge to find Eric’s spectacles and the clock tower, not to mention certain strategically placed ice cream vans. On arrival at the halfway point the majority decided on taking a refreshment break at or near Happy Mount Park before commencing their return journey. This was probably a good idea since the sun really did shine on the righteous on the way back and on everyone else come to that. The varying lengths of refreshment breaks had a separating effect on the return journey, although Chris Butterfield and Marie were only 20 minutes behind the leaders. Now you know why the name ‘Raven Winder’ was chosen for the walk! Dave and Sue Winder reveal all. Amongst the many walkers of the day there was a very creditable finish by Noel Grubb from Foundation Lodge No 5394 which meets at Urmston. He had undergone extensive surgery on his knee some time ago and he did the whole walk and was pleased that he had suffered no ill effects on arriving back at Heysham. He wasn’t sure how he would feel after sitting down for a while, however, but was feeling quite chipper at the finish. Noel wasn’t the only walker from the southern reaches of the Province either. Jason Hengler, who is a member of Commercial Travellers’ Lodge No 2631 and Minerva Lodge No 4002, both of which meet at Hope Street in Liverpool, made the long trip up to take part. As walkers returned to the Provincial trailer, parked at Heysham car park, there was an air of a job well done. Many regaling each other with anecdotes of their own experiences of the day. David Winder stayed until the end, thanking everyone he met for their support and commitment. David anticipates that once all of the sponsorship forms are returned and money received, this event will prove to have raised in excess of £10,000 towards the MCF 2021 Festival. This figure was later confirmed by Phil Preston, who added his thanks on behalf of the many people who will benefit from the generosity of West Lancashire Freemasons, their families and friends. He paid tribute to all who had taken part, particularly those who had worked tirelessly to help organise this event. Over 100 Freemasons, friends and family assembled at Heysham Village to take part. During the walk many pictures were taken by Publicity team members Stewart Aimson Jason Hengler and Glenn O’Brien, far too many to fit into the parameters of this story. However, many more pictures can be found at the following link: Photo album.